Product prices and availability are accurate as of 2019-04-12 01:39:51 EDT and are subject to change. Any price and availability information displayed on http://www.amazon.com/ at the time of purchase will apply to the purchase of this product. 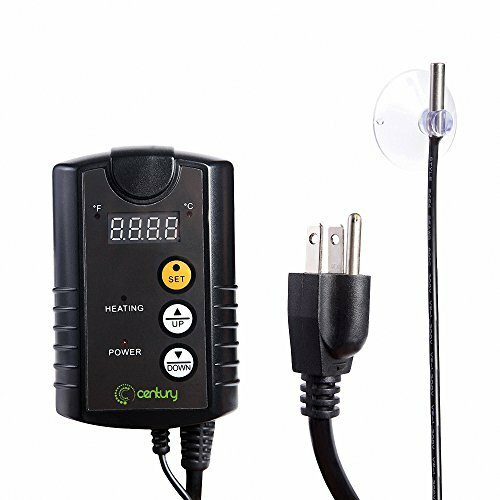 The Century Digital Heat Mat Thermostat Controller allows gardeners to select and maintain optimum; Rooting temperatures for faster seeding or cutting growth. It is compatible with many other heat mats. It works great for controlling plant or pet heat mat temperature. Programming: 1. To display in celsius, Please Press and Hold "DOWN" button for 3 seconds. 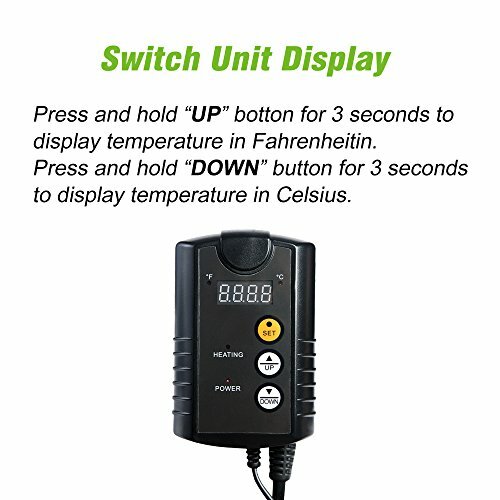 Press and Hold "UP" button for 3 seconds to display temperature in Fahrenheit. 2. To adjust the temperature setting, Press and Hold "SET" button for 3 seconds to enter the temperature selection mode. Press the " UP" or "DOWN" button to adjust the temperature that you want to set. Then Press "SET" button again. So the setting temperature is done. Press "SET" button to display the preset temperature. When the unit is plugged into an electrical outlet, the "POWER" LED becomes lit, the heat on only when the "HEATING" LED is lighted. When the preset temperature is reached, the "HEATING" LED will turn off and there is no power to the heat mat. ATTENTION: If the thermostat remains "ON" ( delivering power to the heat mat) for more than 5 consecutive hours, it indicates the desired temperature is not being reached. To achieve higher temperature the Mat may need to be placed on a more insulated surface. Covering the seedling tray with a humidity dome will also help heat retention. Do not Immerse controller or probe into water. Do not exceed a total of 1000 watts of heating devices plugged into thermostat.
? 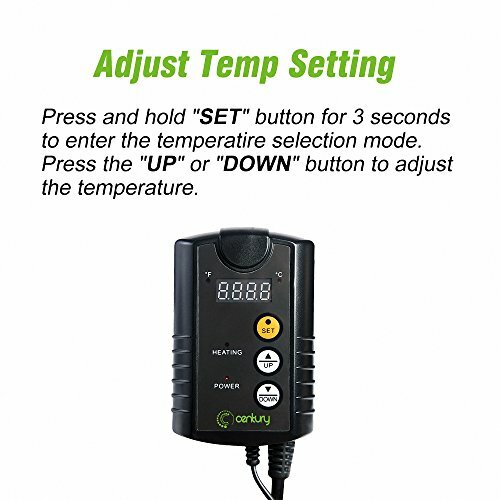 EFFORTLESS HEATING SETUP: Simply set the temperature probe, plug-in the controller, and use the large 3-button interface to choose your desired temperature setting. Digital display supports units in both Fahrenheit and Celsius. ? EASE OF MIND: Handy LED heating and power indicator lights allow you to see the controller's status even in total darkness. Controller features a convenient hanging tab, and a bright, easy-to-read display inside a tough plastic housing. ? RUGGED CONSTRUCTION: The cord for the temperature probe and grounded 3-prong plug measure an extended 6 feet in length, designed to suit almost any application you can imagine. ? VARIETY OF USES: Our thermostat controller can be used for seedling germination, rooting, brewing, heating, fermentation, and more, keeping your various environments in their ideal temperature range. ? SAFE & RELIABLE: Our thermostat controller is ETL listed, and rigorously tested for quality control and safety. Conforms to UL Std No. 60730-1, 60730-2-9. Temperature control range is 40-108°F, temperature display range is 32 -140°F. Rated Voltage is 120VAC 60Hz, Max Loading: 8.3A 1000W. Do not immerse controller or probe into water.